Cranberry Bread to Die For! Heat oven to 350 degrees. Grease bottom of 2 loaf pans: 9X5X3. Sift together flour. sugar, baking powder and baking soda into a large bowl.Cut in the butter until mixture is crumbly.Add egg, orange peel, and orange juice all at once, stir just until mixture is evenly moist. 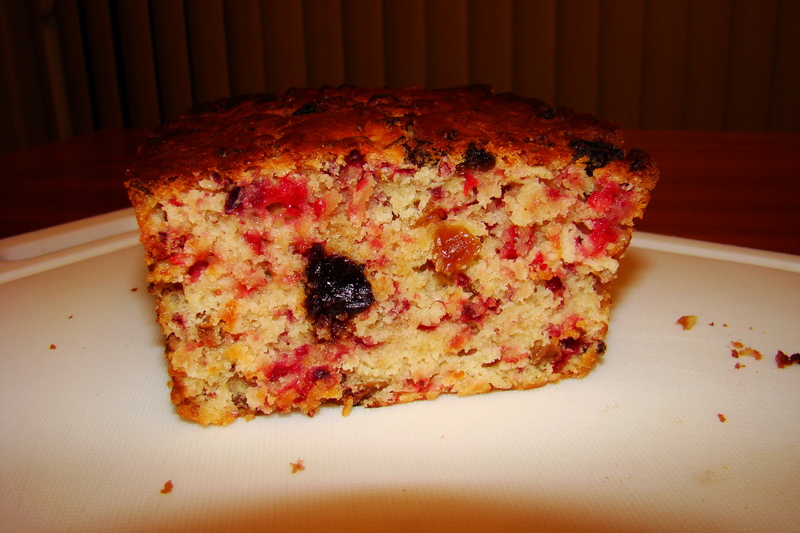 Fold in cranberries, cherries, and raisins. Spoon into greased one loaf pan 9X5X3 or 3-4 small gift loaf pans. Bake at 350 degree oven until tooth pick comes out clean and loaves are golden brown, about 55-60 minutes Cool 10 minutes on rack. Loosen sides from pans, and remove from pans. Cool completely on rack. May store in refrigerator up to a week, wrapped tightly or in a freezer bag. This bread is WONDERFUL!! And it ships like a dream. It is always one that is included in goodie boxes sent out to family. ENJOY!